Lol..my people have taken the game to the next level. Customers in some banks in Ibadan, Oyo State, have expressed fear over the invasion of the Automated Teller Machines in the areas by beggars. PUNCH learnt that in Dugbe, a business district where several banks are located, beggars waited anxiously at the banks’ cash points to receive alms from customers who withdrew money from the ATMs. The beggars on Sunday were also observed in some of the banks in the Ring Road area, where customers appealed to the bank managements to ensure safety by ridding the cash points in the areas of unknown people who posed as beggars. 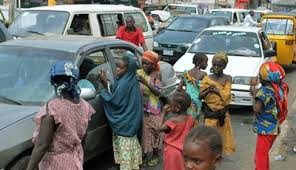 While some of the beggars were women with babies, others were young boys and girls, as well as middle-aged men with various forms of physical challenges. “It is pathetic that the managements of banks would allow their customers to be embarrassed by beggars. The beggars are in almost every bank. They wait for you to withdraw money and then approach you for alms, even at night. A trader in the Gbagi area of Ibadan, Agnes Adetunji, said she withdrew more than N100,000 from the ATM each time she wanted to pay her suppliers, adding that it was possible for informants to pose as beggars and give information to robbers.